Nepal has been an irresistible fascination to me with its juxtaposition of different Asian races in this small yet diverse Himalayan country. 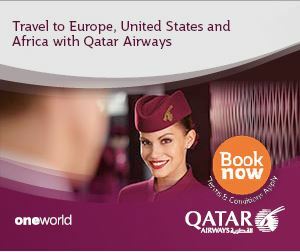 I watch the majestic peaks each time the plane flies over the mountains that separate Nepal and China. This past January, I decided to invite my parents over for a visit. My father, Zhao Jianqiu, is a famous artist in Chinese ink wash painting and very fond of depicting natural landscapes and folk architecture. I was nervous but sure that he would find Nepal interesting. The first morning we had breakfast at a rooftop restaurant in Thamel from where we could see the geographic outline of the Kathmandu Valley. The fog was thick and mountains invisible, but my father was intrigued by the varied forms of low concrete buildings in the city. He was amused by the flocks of crows, which are inauspicious birds in China. I explained that although they are also associated with death in Nepal, people revere them during a special festival. My parents' first encounter with the city was during a walk from Thamel to Basantapur through Jyatha, the same route I took on my first day in Kathmandu. The bustling market and crowded alleys reminded my parents of their youth in the Dongting Lake region of China. Upon reaching Basantapur, my father immediately set up his tools to paint the rather obscure Kotilingeswor Mahadev Temple next to Taleju. He must have been experimenting with the new subject matter and therefore did not choose the more grandiose temples. The Chinese brush-strokes and ink wash created an image that was completely different from the common oil paintings that I saw in Thamel every day, and I was glad to have brought my father to Nepal. My father was impressed by Patan Darbar and Pashupatinath, and complained incessantly that he didn’t have time to find the best angle from which to paint. Bungamati residents were intrigued when he moved the location of the stupas on his canvas for a better composition, and he entertained villagers in Panauti as he bantered with the women knitting on straw mattresses. We travelled to Kakani, where my parents had a glimpse of the Himalayan Range before heading down to Nuwakot Darbar. We stayed at the idyllic Famous Farm inn where we enjoyed superb hospitality and delicious organic food. The views were clear enough to observe both the golden sunset over Ganesh Himal and the dreamy morning mist shrouding the Trisuli valley. In Pokhara, Machapuchre welcomed us every morning and we walked from hilltop to hilltop looking for the the best view. My father was enthralled by the ingenuity and playful designs of the village houses, and he lovingly drew the stone-slab adobe houses shadowed under the snowy peaks, and included our jeep in the painting as an homage to its contribution. My parents returned to Nepal in April, and my father rode rickshaws everyday between Thamel and Basantapur painting non-stop from dawn to dusk. He became friends with the palace guards and rickshaw drivers, and later painted two pieces in their honour. My parents left a week before the earthquake struck. Shocked by the news of damage to the places he had visited, my father worked furiously in his studio to finish the panoramas of Pashupatinath and the Darbars of Basantapur, Patan and Bhaktapur. He also refined a new approach to draw the Himals and created monumental works of the mountains and human residences. His Nepal works have won the appreciation of art critics in both Nepal and China, and will be exhibited in October and November in Kathmandu and Beijing. 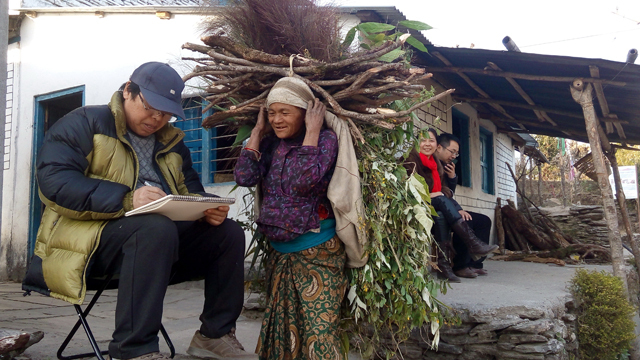 Justin Zhao is with the Beijing Centre for Chinese Studies, and visits Nepal frequently. The exhibition ‘Celebrating the Trans-Himalayan Bond: An Exhibition of Chinese Brush Paintings on Nepal and China’ by Zhao Jianqui marks the 60th anniversary of Sino-Nepal diplomatic relations. The historic ties between China and Nepal go back to the 4th century when monks like Faxian (337- 422) and Xuanzang (602-664) made their way to Nepal, and recorded their travels. Later, there were matrimonial alliances between the royal families of Nepal and Tibet and Princess Bhrikuti helped spread Buddhism. Skilled Nepali craftsmen journeyed to Tibet to construct monasteries and share metal casting and pauba painting skills. The Nepali artisan Arniko left an indelible mark in Beijing with his White Stupa. So, when Zhao Jianqui came to Kathmandu he saw the architectural antecedents of the monuments and shrines of Tibet and China here. The echoes of history are found in his ink and brush depictions of Kathmandu and the Himalayan landscape. The paintings have a Chinese character, but the subject matter is Nepali. Intricate brushstrokes on Chinese rice paper capture the urban vibrancy of Kathmandu and the vast vistas of the Himalaya. Earth tones dominates the artist’s palette and colour is used sparingly -- sienna highlights the terracotta composition created by the roofs, red accentuates the fabric that hangs directly below the temple roof and yellow marks the brass spires and domes of revered monuments. Emphasis is laid on only a few members of a crowd gathered at the courtyard – a delicate wash of translucent color highlights their vestments. Motorcyclists, blue plastic water tanks and an obscure garden umbrella are treated similarly. Zhao’s ‘Village near Pokhara’ provides a lead into larger panoramic paintings of the Himalayas. The painting is an idyllic celebration of the rural as the artist portrays a small cluster of village homes, literally in the lap of the towering Himalaya. The vegetation and hay stacks illustrated by the artist are a sharp contrast to the barren mountains in the distance. Zhao’s monumental landscape painting of the Himalaya shows craggy snowcapped mountains shrouded in mist. This exhibition also includes Zhao’s exquisite paintings of the diverse Chinese landscape and folk architecture, from the southern lakes to northern hills. The juxtaposition of Zhao’s Nepal and China paintings are a celebration in canvas of the historical and cultural ties between the two neighbours. 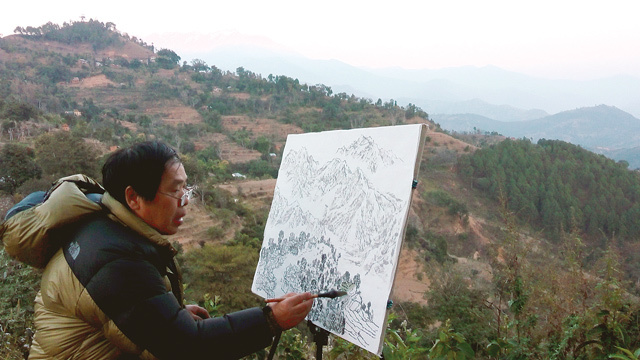 Noted Chinese artist Zhao Jianqiu spoke to Nepali Times about his forthcoming exhibitions in Kathmandu and Beijing. Nepali Times: Why did you choose Nepal for your art? Zhao Jianqiu: Nepal is an enchanting country. My initial curiosity and longing for new inspiration led me to explore Nepal, and immediately I was overwhelmed by the grandiose and exquisite classical architecture, as well as the spectacular natural scenery of Nepal. So I was determined to paint what I saw. Does your Chinese technique work for these paintings? The secret of Chinese ink wash painting’s longevity lies in its absorptive spirit, and learning from other art is the key to creativity. I take inspiration from Nepal’s architecture and scenery and realise new forms and expression for my art. The exhibited paintings are experimental works and I welcome criticism from Nepali artists and audiences. As an artist what impressed you the most about Nepal? 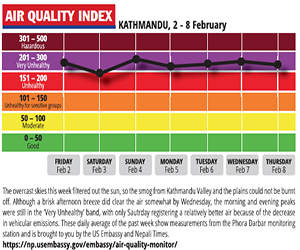 The Gods favour the Nepali people and confer visitors a sense of security. The incomparable hospitality of the Nepali people makes me feel welcome and at home. The fantastic architecture of the Kathmandu Valley embodies the core of the Nepali people’s wisdom and creativity. I feel extremely privileged to have seen this great heritage in its totality before the damage of the earthquake. Though Nepal’s current economic development is facing challenges, her rich natural resources and unspoiled ecology are Nepal’s strength and true treasure. The rich and intricate texture, lines, and forms in Nepal’s architecture and folk houses are a gold-mine for Chinese brush paintings. The ink wash painting style can deliver the delicate charm of old bricks, walls, wood and tiles. 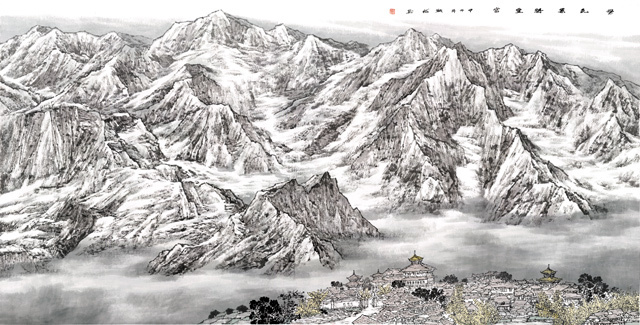 The bright natural colors and formidable mountain peaks allow an adaptation of Western oil painting style in traditional Chinese ink wash painting. Even one year later, Ghorahis children are still traumatised.